This year was a year of big change for our family. We MOVED. Not across the country, not even across town, just a couple blocks from where we’d lived before! But boy was it still a lot of work. And well worth it! We thought we were all settled in – boxes unpacked, pictures hung, walls freshly painted. Doing life in our new house. All is good, right? Well, all was good until it came time to decorate for Christmas. We hauled out all of our boxes, our beloved Christmas treasures and began finding places for them to adorn our house. 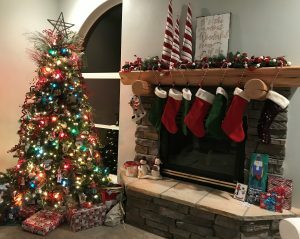 While we admired each one, we were hit with the realization that these decorations didn’t fit the same in our new house. Our fireplace mantle in our previous house always seemed so grand and beautiful to us, but our new mantle, adorned with the same decorations looked barren and out of place (we lost a few decorations in the move because when you only move a couple blocks you tend not to pack things as well – bad idea! Pack well my friends!). Before was…meh. Our new larger fireplace needed something more. 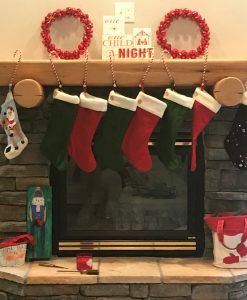 My daughter and I stared at the mantle. What to do, what to do? All we could do was laugh. We laughed, we reminisced about the old house and then we made a plan! We set out to the local craft store and got creative. After an hour or so of wondering the aisles, we had a cart full. We googled some coupons and discovered the entire store was 25% off, including sale items (whoop whoop). And proceeded to check out. After another hour at home arranging and rearranging our newly found treasures, our mantle was perfect. It all felt cozy and complete. Voila! We are ready for Christmas now! have the opportunity to move. Hard work; emotions of excitement, fear, anxiousness, joy; more hard work; and then the feeling of being all settled in again. It’s a beautiful process of purging your things, deciding what’s important, creating new memories. We embraced the change, faced the unknown, and for that, I’m so thankful.